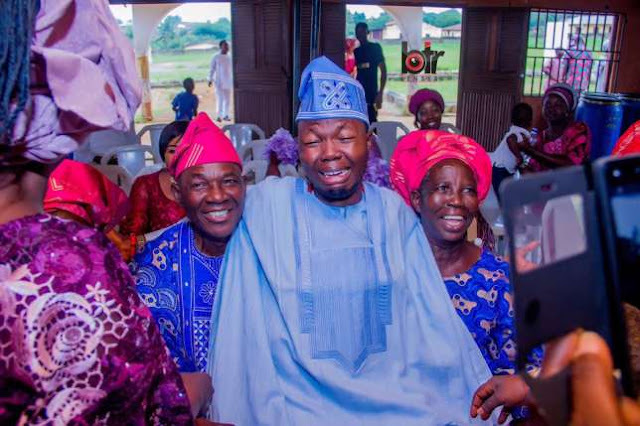 Home / gist / Groom Cries At His Wedding Because He Doesn't Want To Leave His Parents! Groom Cries At His Wedding Because He Doesn't Want To Leave His Parents! There is a special photo of a crying groom on the Internet that has left people a little confused and... pretty amused. Nigerian photographer, Beta Adewale Adediran of BTR Lenses shares a photo on his Facebook page which shows an agbada-wearing groom shedding tears as he perches on his parents legs. The reason for his wailing? He could not bear to leave his parents now that he’s getting married, According to the Facebook post which was shared on November 5 2018! While photos of crying grooms have always been a hit on social media because of the powerful emotions often linked with such photos, this Nigerian groom’s photo has left many surprised, many others amused. This is because when when grooms cry at their weddings, it is usually thought to be for other reasons such as watching the bride walk down the aisle or just being overcome with emotions while reading the wedding vows. It is hardly ever heard that a groom tears up because he can’t bear to leave his folks. Traditionally, this is an emotion which finds expression in women rather than men. But then, it’s OK to cry. It's fine to shed tears when you feel like it. And we can't for a second take that away for this trending groom. We just hope he quickly got over it and had the time of his life on his and his bride's big day!